Experience life in one of Naples' most pleasant neighborhoods just steps to the beach! Southern Sunset is a luxurious property that offers guests all the comforts of home right in our Olde Naples beach paradise. Enter from the circular drive into an open living room with views out to the private covered lanai, heated pool and hot tub beyond. Lush landscaping provides ultimate privacy around the pool area, which is complete with chaise lounges and southern exposure for soaking up the sun! A screen enclosure keeps bugs away so you can enjoy grilling meals outside on the gas grill and dining under the covered lanai. Inside, a split floor plan places the master bedroom on the west side of the house with a king size bed, flat screen TV and massive en suite bath. Two guest bedrooms are located on the east side of the house along with a den/office with a sleeper sofa. Built for entertaining, the home's fully equipped granite and stainless kitchen with breakfast bar opens to a smaller dining area for four while the formal dining room seats an additional six to eight people. 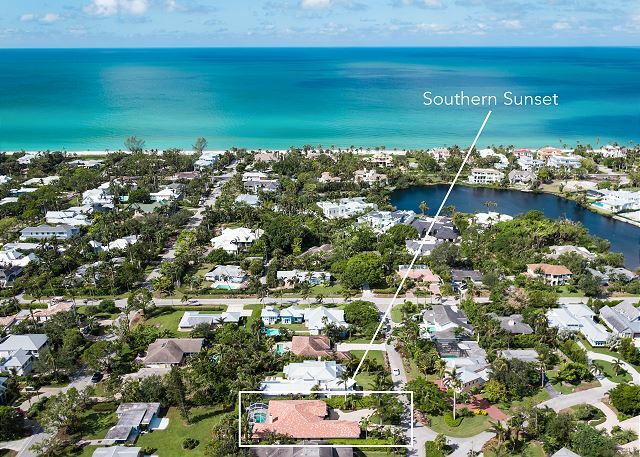 When it comes to location, Southern Sunset will delight even the pickiest of Naples lovers! Less than half a mile to the beach, the home is set on a quiet Olde Naples street with little to no through traffic. Some of the best sunset viewing in town is done from the nearby North Lake Ave Beach Access and the Naples Beach Hotel is just a few blocks further north, where every evening is a sunset celebration! If you’re looking for a quiet and private place to relax in Naples, Southern Sunset is calling! Master - located on west side of the house. En suite bath with dual vanities, walkout shower, open bath tub and water closet. French doors to the lanai. Guest Bedrooms 1 and 2 - located on the east side of the house with a shared bath between them. Den/4th bedroom - located at the back of the house on the east side. Desk and sleeper sofa. Adjacent to pool bath, which has a shower. Booking Details: Dates are not confirmed until we receive your inquiry and approve your rental. Between January-April, a 2+ month rental may be required. Please inquire! The location was perfect, the house comfortable, the lanai and pool lovely. All good. Thank you, Robert! The location of Southern Sunset is ideal! So glad you enjoyed the lanai area and took advantage of the heated pool and spa. Hope to host you again in the future!